CrowdCall offers totally free conference calls to a group of people. But it does it in such a smooth and easy way that it's pretty amazing. It's true that you can create a conference call directly from your iPhone, you dial a number, then hit add call. However that costs you additional minutes and the more people you add to the call, the more expensive it gets. Plus it takes a long time to add each partipant to the call, especially if you are doing this for more than 3 people. Or you can use CrowdCall. CrowdCall lets you very easily create free conference calls with your contacts, without them even needing to download an app. You don't even have to sign up for CrowdCall. Just install the app, create a group that you want to call (these are stored so you can easily call groups that talk frequently, like family, management teams, etc...), and the app calls everybody in the group with a single click. There aren't even line charges. The originator of the call makes a local call and all the other participants get called back anywhere in the world. 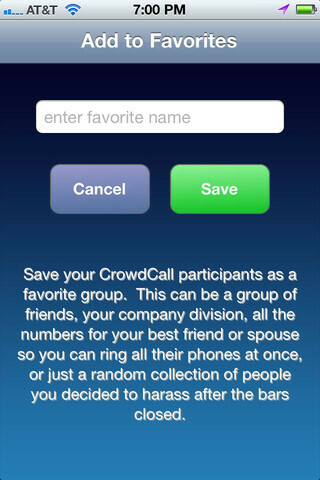 That means that you can even create group calls using CrowdCall with people who don't have a mobile phone. There are no conference call numbers or pin codes to remember, just hit the button in the app, and everybody in the group gets a call. And to top all of that, guess how much CrowdCall costs? Yup, it's free. This is one app that is going directly into our essential apps list. 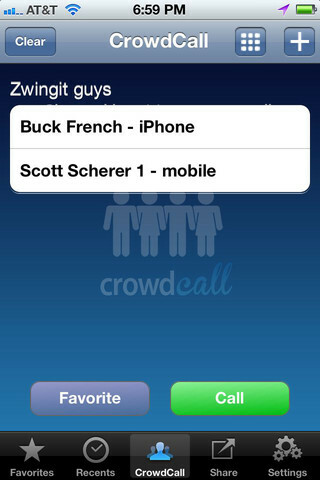 CrowdCall is available for the iPhone and for Android.